Today, I will be snuggled up with two giant pups watching the Thanksgiving day parade and gleefully anticipating the big mans arrival while trying to whip something up for our last minute turkey day plans. The afternoon will be filled with friends and family. I hope those of you who don’t have to work today, are enjoy Thanksgiving with your loved ones. And for those who are working today, I hope you get an extra day off or some serious double pay some time soon too! Pumpkin pie may be the most talked about dessert on the t-day table, but I can’t imagine a Thanksgiving without apple pie. Now, my father has a killer apple pie recipe, but since we are competitive, I had to give this one a try. 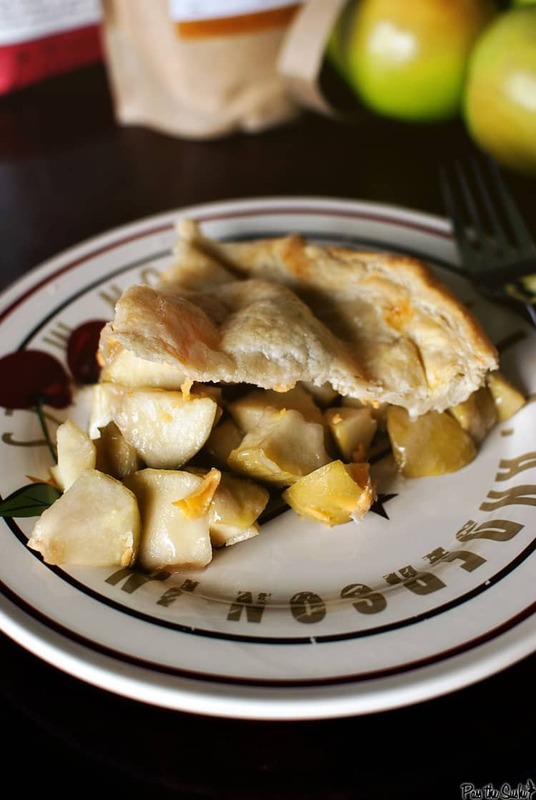 The idea of sharp cheddar with warm apples was something that had been peeking my interest since I received Pie it Forward. And after making it, I’m glad I did. It’s totally not my dad’s pie at all. It’s different and the puff pastry crust really makes for a very interesting pie. Now, if you’re looking for traditional – this is not it. Its good and it’s different, but it wont ever take the place of a classic apple pie. Cut the dough in half, one slightly larger than the other. Wrap the smaller section in plastic wrap and return to fridge. On a lightly floured surface, roll out the dough to an 11″ round. Carefully transfer to a 9″ pie plate and press into the plate. Don’t trim the over hang. Refrigerate 20 minutes. In a large bowl, whisk together the maple sugar, flour, and salt. Meanwhile, core the apples and dice them into 1/2″ cubes. Toss in the bowl with the sugar mixture and stir with a wooden spoon or your hands to coat. Pour the apples into the prepared pie shell. Pile the extras in the center. 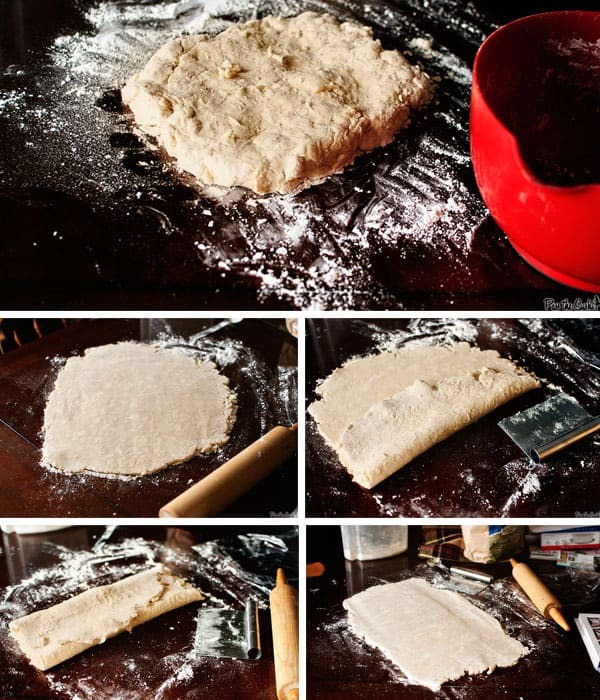 Roll the second piece of dough into a 10 or 11″ round. Remember, you have to cover the top with the pile of apples and pinch. Cover the top of the pie and crimp as desired. Slice a hole to vent in the center. Brush the dough with the eggwash and place pie on a baking sheet. Bake for 45-50 minutes, or until top is golden brown. At the beginning of the quick puff pastry, there is a note stating that the recipe can be substituted for an all butter or part butter pie dough. I am very glad I didn’t just jump on they excuse to make an easier dough. Tackling this one was worth it. Also, I halved this from the original recipe knowing I didn’t need a ton of extra puff pastry at the moment. In a large bowl, stir together the flour and salt. Dice the butter into small cubes and toss into the flour. Pour flour mixture into the bowl of your food processor and pulse 10 times. Pour back into bowl. Add the water and swirl around the bowl. Using your hands, mix the water into the flour mixture and knead until dough just comes together. Turn out onto a large clean work surface that has been dusted with flour. At this point, the dough is not pretty. It is a clumpy mess that isn’t sticking together. Form into a rectangle and cover with plastic wrap. Let sit for 10 minutes. Remove plastic wrap and sprinkle dough and rolling pin with flour. Roll out the dough into a large rectangle, about 12×20″. Don’t worry about making the edges pretty, there’s still a bit of rolling to do. Starting with one short side, fold like you would a paper going into an envelope, towards the center (see image below). Fold the other side over it. Turn 90 degrees and roll out again. Fold and repeat steps two more times. Wrap the dough in plastic wrap and allow to rest in fridge for at least 20 minutes before using. 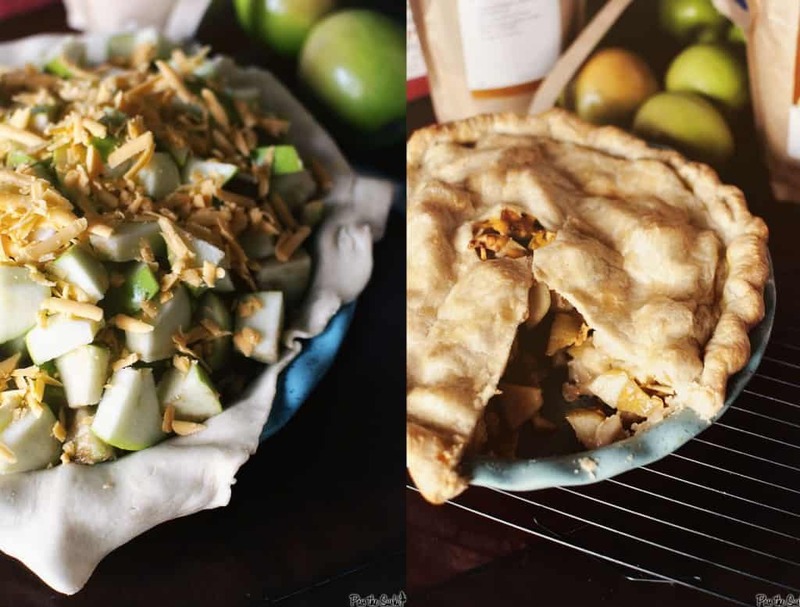 Enter to win a Pie Baking Kit from King Arthur Flour! 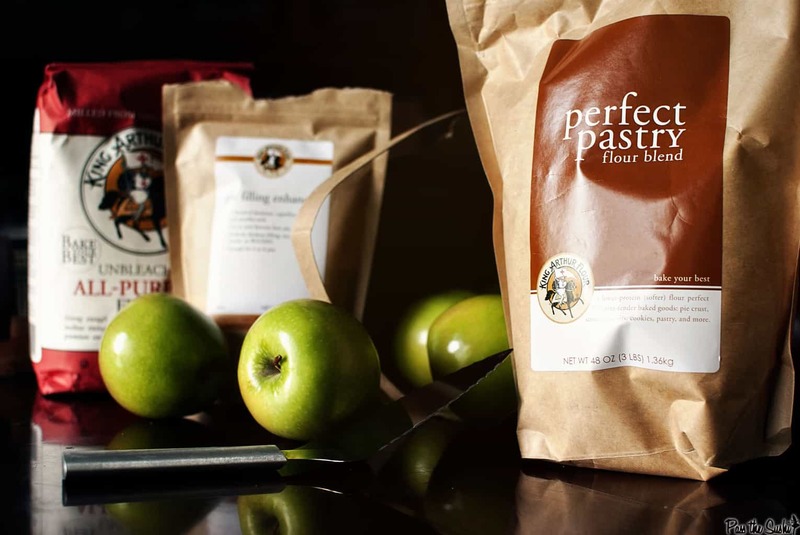 Go check out the King Arthur Flour page and make your dream list for the upcoming holiday season. Pop back over here and let me know what one ingredient you have got to try. 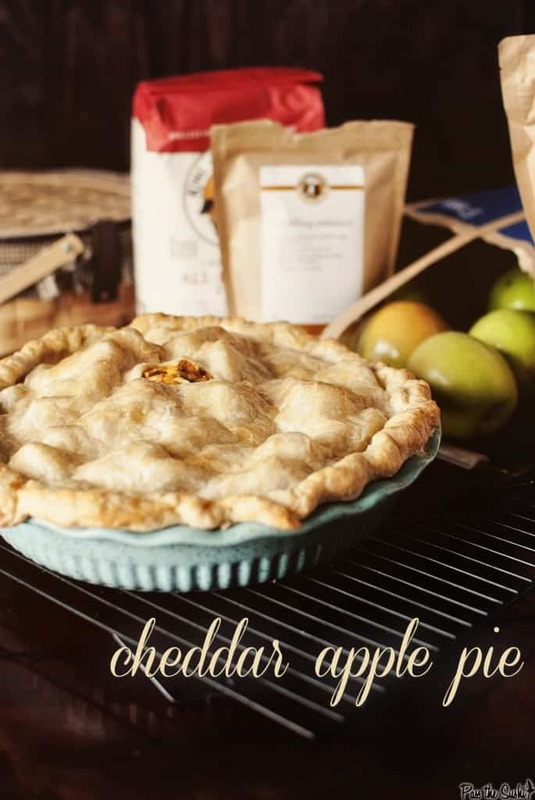 You will be entered to win this awesome kit from King Arthur Flour including a pie server, a coupon for a 5lbs bag of flour, Pie Filling Enhancer, and Pastry Blend. Entries accepted through November 29th at Midnight EST. Winner will be contacted on 12/02/12. Bonus! For today only (Thanksgiving Day – until midnight) get free shipping on orders over $60 by clicking the button below! Feel free to check out their holiday sweepstakes going on on the King Arthur Flour facebook page as well! I have been wanting to experiment with different flours, so I would pick either the gluten-free flour or their rice flour. I follow KAF on Twitter! i’d love to try the guittard bittersweet chocolate sprinkles! i follow passthesushi on facebook! i am subscribed via RSS! I love your recipes! Just started following your blog and your Facebook page after already following you on Pinterest for some time! My husband and I always joke about the fact that we like to make fat kid treats and you have expanded our rep oratorio. Would really like to try their rye bread flour! I already do subscribe via email for updates. I follow Pass the sushi on FB. I have my eye on several extracts. I would love to try that Cranberry-Raspberry Flavoring and I’ve been eyeing the Espresso Powder for months! I could definitely use some new bread pans from King Arthur Flour! I liked Pass the Sushi on Facebook! 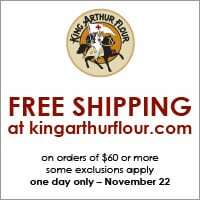 I liked King Arthur Flour on Facebook! I don’t know that this would be considered an ingredient, but I’m dying to try the Caramel Mustard dip! I’d love the mini cinnamon chips! I like KAF on FB. I’d like to try espresso powder. I’ve heard it is really good in brownies and chocolate chip cookies. I Follow Pass the Sushi on Facebook. I Follow KAF on Facebook. I Follow Pass the Sushi on Twitter. Here’s some flattery: Your pie looks great, especially the top crust. I still haven’t tried Vanilla Bean Paste. I’d love to though. This pie looks awesome. Have never had cheddar in apple pie before but I’ve always loved the two together. Great giveaway! I’d love to try the cappucino baking chips ! There are so many things I want to try. One item that has been on my list for a while is the Raspberry Jammy Bits. That is one amazing looking pie. Subscribing to my RSS Feed..✔. I would like to try some of the bread and dough flavorings that KAF offers, but I really want to try the soft diced ginger! I am already friends with you on facebook and am now friends with KAF. I don’t tweet, but I joined the email list, subscribed to the RSS feed, and pinned this post! I’d love to try the cappuccino baking chips! I’d love to try their European Candied Orange Peel! It would be fun to make and taste some zesty goodies! I’d like to try the Vietnamese cinnamon. I like Pass the Sushi on Facebook. I like KAF on Facebook.